Garlic… I forgot about you. 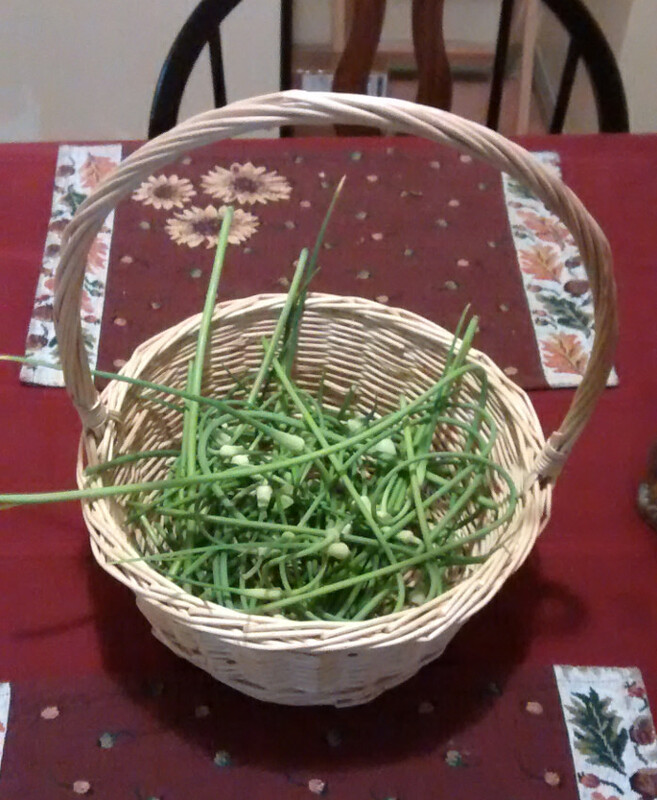 I don’t really know what to do with garlic scapes. Some were used in stir fry and they were good! The rest I pickled. I haven’t tasted the pickled ones yet. Driving on my way to work I saw this blue streak on the side of the road, from the corner of my eye. 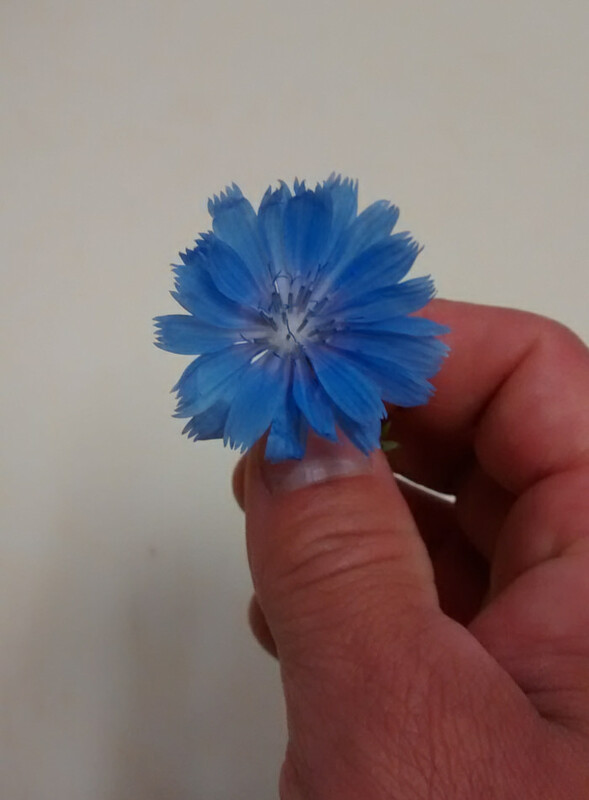 Could it be wild chicory? I was running late for work (as usual) so I didn’t stop to look, thinking that I would check them out after work. When I came back the flowers had disappeared! I couldn’t find the plants anymore. 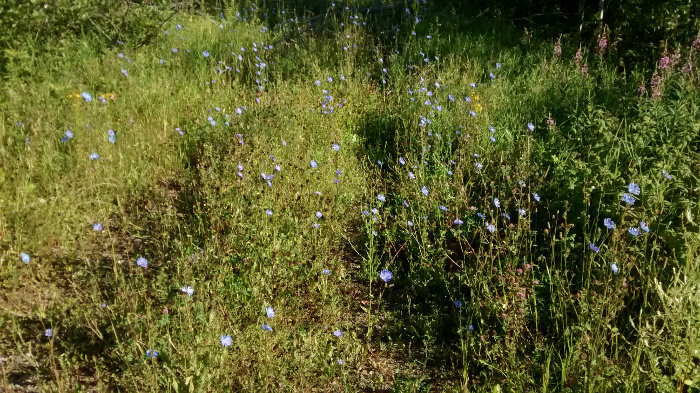 It took me a while to catch on, wild chicory is shy and only opens up for a couple hours in the morning. Eventually I got to them. Mine keeps getting eaten, it was good luck to find some truly wild ones. The colors are a little off, too much blue here. But it is still a most beautiful flower. 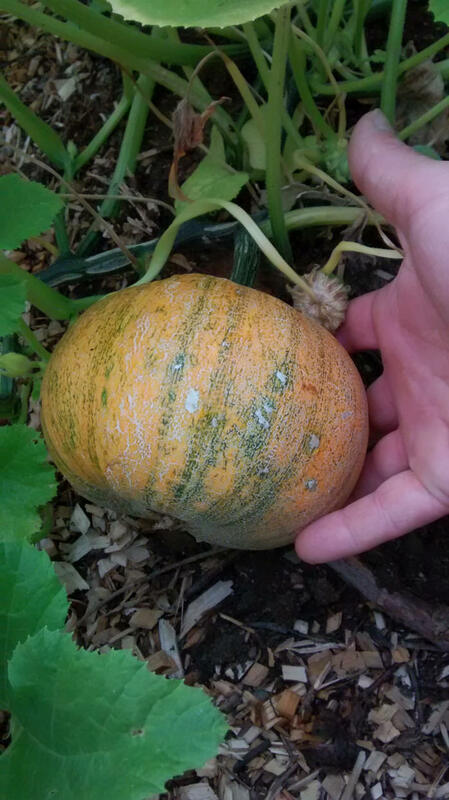 I think I’ll persevere and try again next year in the garden. 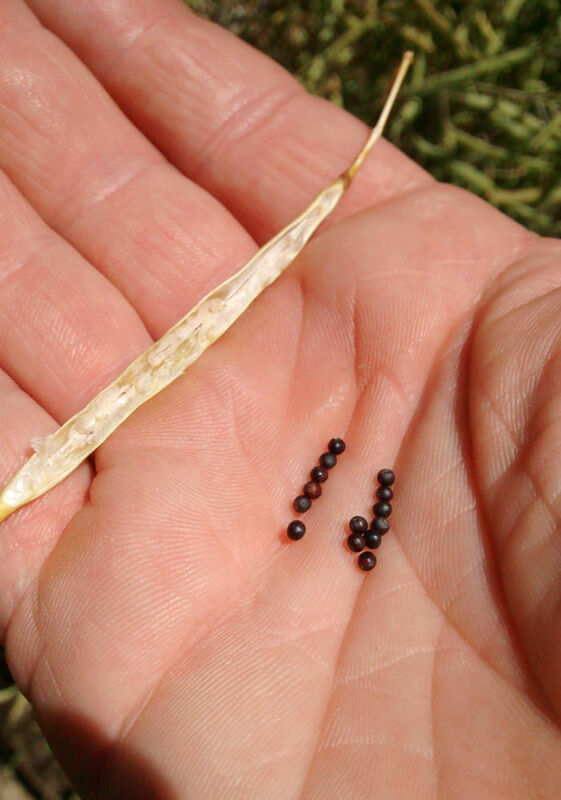 My first seeds Next year hares are going to love me. 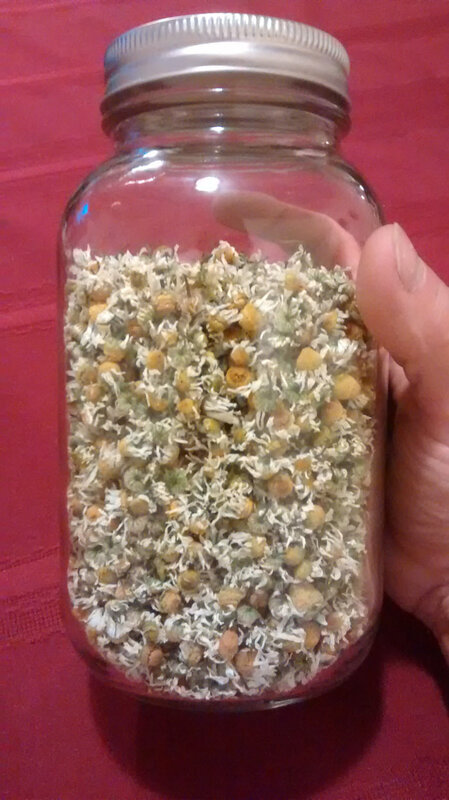 Picking chamomile’s flowers is as soothing as drinking its tea. That is a good thing because it takes a while to pick this much! After being picked clean the patch will bloom again after 2-3 days of sunshine. This is a one litre jar (1 quart). At the end of the season I got 4 full jars and a bit more. The first Winter Luxury is finally getting some colors. There are others and they are all going to be larger than this one. 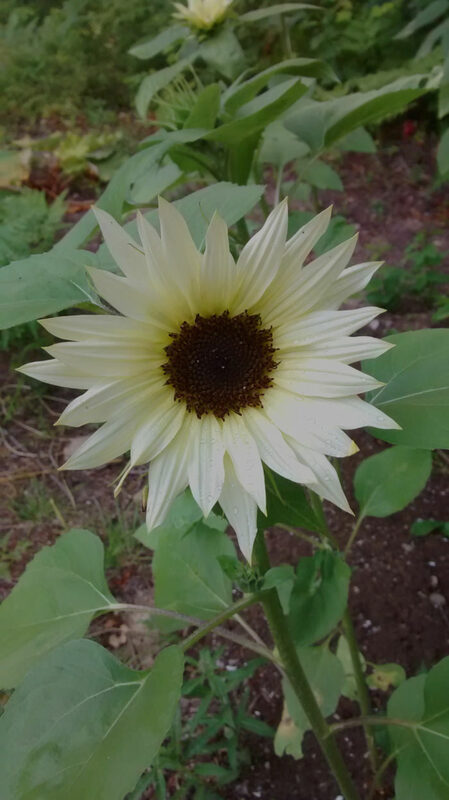 Moonshadow, one of two sunflower varieties in the garden. It’s about 5 inches across. Stunning, especially at dusk when they appear to glow.. Giant Mammoth Russian is taking its sweet time. I quickly realized it wouldn’t reach 12′ tall. 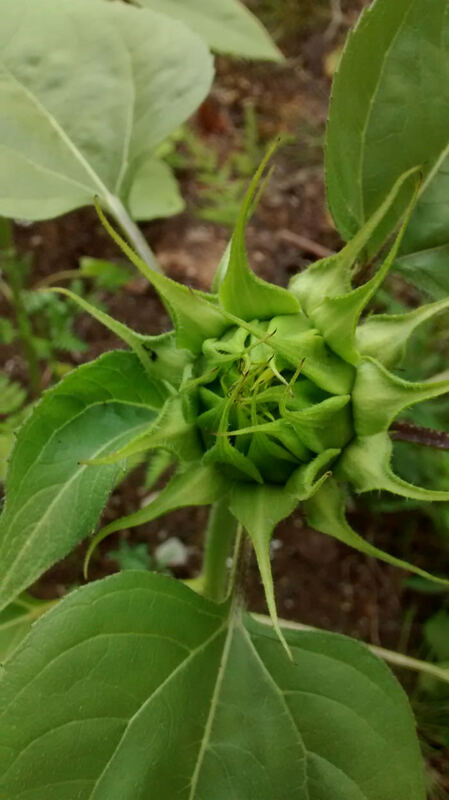 Oh well… It is still an impressive plant, reminds me of Mario Bros’ Piranha Plant. I got 5 chickens from my farmer friend. I don’t know anything about their pedigree. he’s got hens and roosters and they mingle and that’s where my chickens come from. He caught them with a net and we put them in a box in the trunk of my car. I then got back home immediately because it was kind of hot that day. It was a 30 min drive. I could hear them complain when I made stops. Back at the garden I opened the trunk and was alarmed at the heat coming out of the box. Poor things! Timidly I put then in the coop, not sure how to handle chickens. So delicate! Now I know how tough they are. They were around 4-5 weeks old when I got them. A small step for chickens and a giant one for me. Having livestock completely changed the feel of the garden. For some reason it felt more alive. It made me nervous because I had the fate of 5 animals in my hands. But like I said, they are tough!